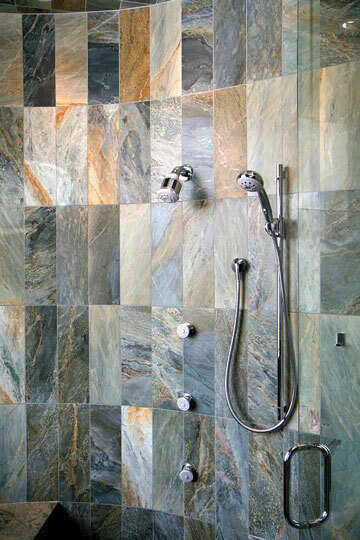 Fittings for your new shower stall can be chosen from an array of styles and finishes. Chrome has been the finish of choice for many years, but brass, bronze, pewter, and nickel have become popular of late. Polished, satin, or brushed finishes are available, and fittings can harmonize with the style of your bathroom — traditional, Victorian, contemporary, or rustic. Shower fittings now come with multiple and varied height showerheads and adjustable body jets and sprays. These may also be configured as jetted panels or shower towers. Some are available with minimal attachments which work well for a remodel in an existing shower. While you might enjoy going through a "car wash," these units do use a lot of water! These fittings may require oversized supply lines and a dedicated hot water heater. Existing shower fittings can be upgraded by replacing a showerhead or adding a hand-held shower with adjustable height. Oversized showerheads create a warm "rain shower" while a single showerhead can be adjusted to produce a pulsating and massaging spray. These options are far less expensive than rebuilding the whole shower stall. Along with the fitting upgrade, add a bright new shower curtain and a new curtain rod, and the whole appearance of the bathroom changes. Special fittings are made to fit "the old claw tub" and make it usable as a shower. The showerhead on a water supply pipe is attached to the tub faucet and a "ring" shower curtain rod allows a shower curtain to fully surround the tub. Shower stall safety is an important concern. 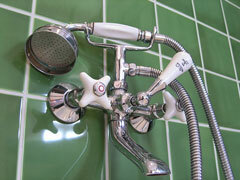 Pressure-balancing valves can help prevent scalding if someone uses water nearby while you are in the shower. Thermostatic valves can help maintain preset water temperatures. Grab bars, suitably located and installed, can provide assistance entering and exiting a shower, and can help prevent falls. Browse the websites listed below to find a broad selection of showerheads, faucets, and accessories. Delta produces a wide variety of shower valves, shower system components, and showerheads. They offer many styles and finishes to fit any bath decor. This fast-growing, American plumbing company produces luxurious showerheads in both single and multi-function models. Also among their offerings are a wide variety of shower and tub faucets. 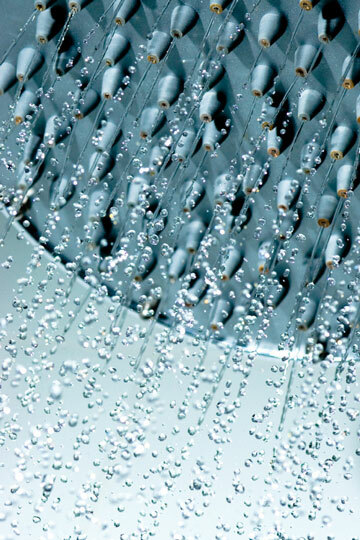 Grohe offers all kinds of shower systems and hand showers. Their systems include panels with body sprays delivering a variety of sensations. Anti-lime systems are included on their shower outlets. Save gallons of water with Oxygenics' selection of water-saving showerheads. Both fixed and handheld showerheads are available. Producer of shower systems, showerheads, and components. They offer many designs and finishes to suit your style. This manufacturer offers preplumbed shower panels with multiple showerheads.